As beards are becoming more stylish and seen as both manly and fashionable, it’s becoming common to see beard butter featured as a part of a man’s bathroom arsenal. This product comes in a variety of types, so if you are thinking of investing in this miracle substance to tame your facial hair, it’s important to first understand what it is and what it does before you choose one for your needs. Without further ado, here is everything you need to know about beard butter. If you have a beard, you probably know what an unruly mess they can become if not properly groomed and cared for. There are a number of online references on how to properly care for your beard, but beard butter should always be part of the package. It is the miraculous solution for taming your beard and making it look glorious. This item is a thick, oil-based product designed to help keep your beard moisturized and well-behaved. In addition to enhancing the appearance of your beard, it also helps soothe irritation your beard may be causing you. If your face feels itchy or sensitive because of your facial hair, you might find that beard butter is the perfect solution for you. It hydrates your skin and gives it a soft to the touch feeling that will make you want to show off your beard with pride each day. Although this product feels like oil, some still consider beard oil to be a better choice for them, in which case we recommend our Beardoholic Premium All-Natural Oil. Beard butter works effectively by using its specially formulated composition to penetrate deeply into your facial hair, both nourishing and effectively conditioning your beard. This keeps it feeling soft, looking silky, and healthy. Another result of a regular application of this product is a prevention of typical beard ailments, such as itchy beard and wiry curly beard, so your facial hair will no longer feel uncomfortable against your skin and all that will be left is your lush, manly beard. Some beard butters will also contain a little bit of wax in their composition. This is the ideal type for you if you are going to spend time trying to style your beard, as these formulas provide all the benefits that come from beard butters without wax. However, they have the added advantage of providing the hold you need to achieve the style you are hoping for. Want to know how to properly apply facial hair butter to your beard to achieve the best possible results? Get a small bit of the butter, enough to fit on your fingertip. A little bit goes a long way, don’t forget this rule! Rub your palms together to get it coated over your hands. Rub and massage your face and beard thoroughly. It’s important to get in deep to ensure that every part of your beard is exposed to the nourishing and conditioning properties that the butter offers. Don’t forget to ensure that you thoroughly coat the roots of your hair follicles. This is important, as it helps in preventing itchy and wiry beard and ensuring that new beard growth is as healthy and moisturized as possible. Use a wide-tooth comb like Kent Handmade Comb to get the product evenly dispersed throughout your beard. You can do this by combing through your beard, starting at the bottom and brushing up towards your ears from both directions. Of course, this will get your beard all puffed up, but it will help get the butter distributed properly throughout your beard. Don’t forget to wash your hands when you are done to remove the oils that are usually one of the ingredients of the facial hair butters. If you follow this method for applying beard butter regularly, your beard will stay healthy, soft, silky, and smooth for the long run! Want to find the beard butter that’s best for your unique needs? Here are the options that everyone is raving about! Boasting 13 natural, locally sourced ingredients to get users the best results, the Wild Willie’s Butter is organic and made in the USA. The product doesn’t contain any chemicals, preservatives, colorants or fragrances. It moisturizes your beard, encourages facial hair growth and helps you say goodbye to your itchy beard and flaky skin. On the top of that, this item also gives your beard a slight hold and after using it for some time, you will notice that your facial hair is stronger than ever. You can expect that a coarse beard with split ends and hairs growing in all directions will become a matter of the past. In addition, you won’t have to deal with irritation anymore. 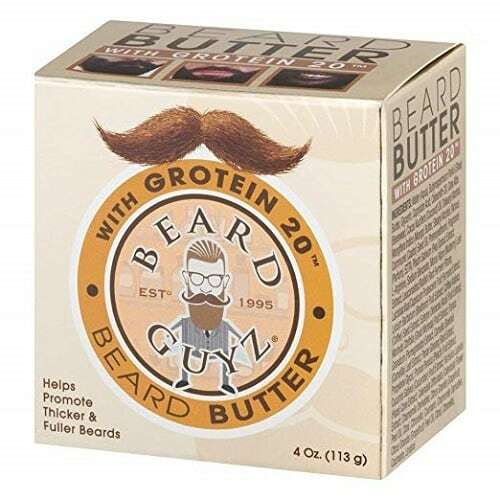 Created to help you have a fuller and thicker looking beard, the Beard Guyz Butter with Grotein is very easy to apply and spreads through the beard quite nicely. It doesn’t feel too oily or heavy and most guys who have used it claim that the scent is pretty pleasant. However, this is rather a subjective matter and you may not like the smell. This shouldn’t worry you too much because the scent dissipates fairly quickly and leaves your beard free from knots and easy to comb. Proprietary blend of 20 natural extracts and oils includes mango and cocoa butter, along with the coconut and castor oils. There will be no greasy residue after the application process because this product soaks into the facial hair in just a few seconds making it look great and manageable. The blend of the Maestro’s Classic Mark of a Man is specifically designed to soothe those suffering from an itchy beard and to help men make their facial hair more manageable. Transforming unruly beards into something luscious and soft, this is an ideal choice for all beard owners. Its consistency is quite creamy which makes it simple to spread over the facial hair. Don’t forget that a little goes a long way, even if you have a long beard. Thanks to this kind of consistency it’s not too oily and greasy. After the application, your facial hair will be more manageable to comb through and much softer than before. As a bonus, it will also stay in the desired shape because of the light hold this butter provides for taming stubborn hairs. The smell is not overwhelming and most men find it rather pleasant. 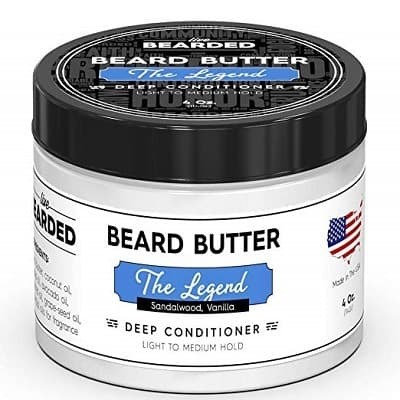 With the custom formula that locks in the moisture, controls flyaway hairs and makes the beard look and feel smoother, the Legend Sandalwood Butter is a game changer. It’s entirely made of natural ingredients with the pleasantly smelling sandalwood and vanilla notes. The product is crafted to dissolve perfectly and leave your facial hair soft and lustrous. You won’t have to handle the heavy and oily feeling that most other similar products leave after the application because this one is nothing like that. It doesn’t make your beard feel greasy or over shiny. Make sure to apply it after washing and towel drying your facial hair to experience the best results. 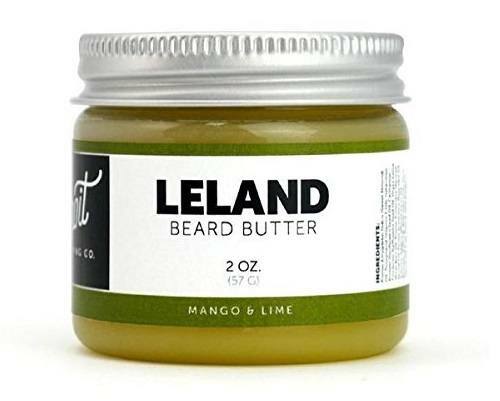 The perfect combination of mango and lime of the Detroit Grooming Leland makes your beard smell refreshing and clean the whole day. The scent is strong at the beginning, but fades a bit after some time and leaves a very faint smell that lasts all day. What’s more important in this product is the fact that it conditions both the skin and the beard, making them soft and healthy. It tames the stray hairs and keeps them in one place thanks to its holding properties similar to the ones a balm has. Want to make your own beard butter from home? Doing so allows you to know exactly what is in your formula, and gives you all the freedom to tweak it in future batches to get the balance that is ideal for your hair and skin type. Begin by melting the beeswax. You can do this using a double boiler, or a glass jar in a pot of boiling water. Add coconut oil to the melted beeswax. Finally, add the shea butter and remove the formula from the heat. Mix until the shea butter is completely melted. Add essential oil as desired. As you can see, this recipe is extremely simple and there is a lot of room for customization. You can try adding other ingredients, or even infusing your coconut oil with ingredients like rosemary, to introduce even more benefits to your homemade facial hair butter. If you are interested in making your own beard balm then read this guide and if you want some high-quality balm from one of the leading manufacturers try Honest Amish Leave-In Conditioner. What differentiates beard butter from beard balm is its ingredients. 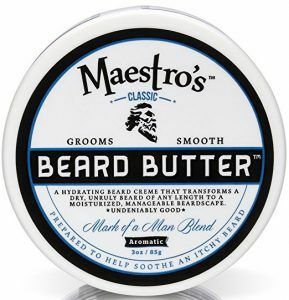 The first one consists primarily of – you guessed it – butter, such as shea butter, which is extremely good for the beard. Beard balm, on the other hand, usually also contains wax in addition to other ingredients you can find in the butter. 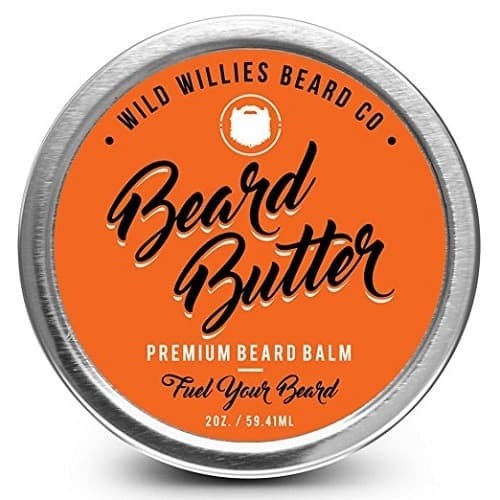 What this typically means is that beard balm can provide the same nourishing and moisturizing advantage to your beard that the butter can, with the added benefit of providing the extra necessary holding power that you need if you are looking to style your beard in a certain way. 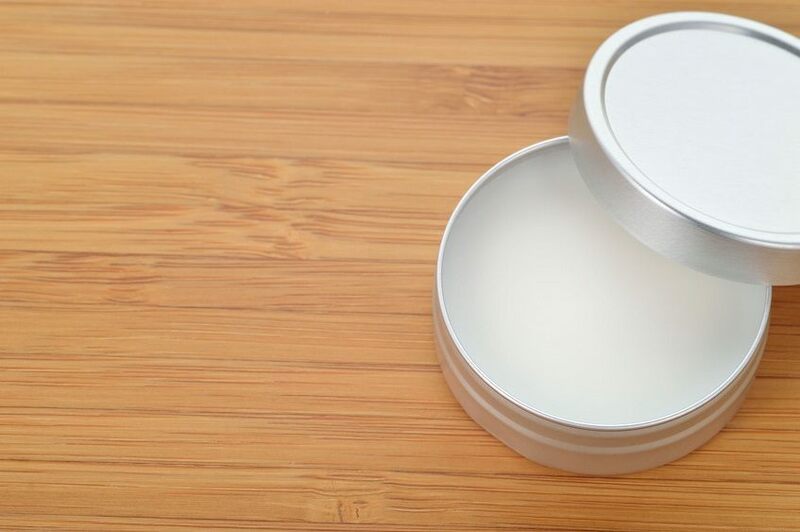 While butters often include wax as well, it is typically much less than what you would find in a beard balm. While the two beard care products are extremely similar, they are not precisely the same. The biggest drawback of beard balm that users experience is the fact that it often provides a hardening effect due to the typical amount of beeswax included in the formula. 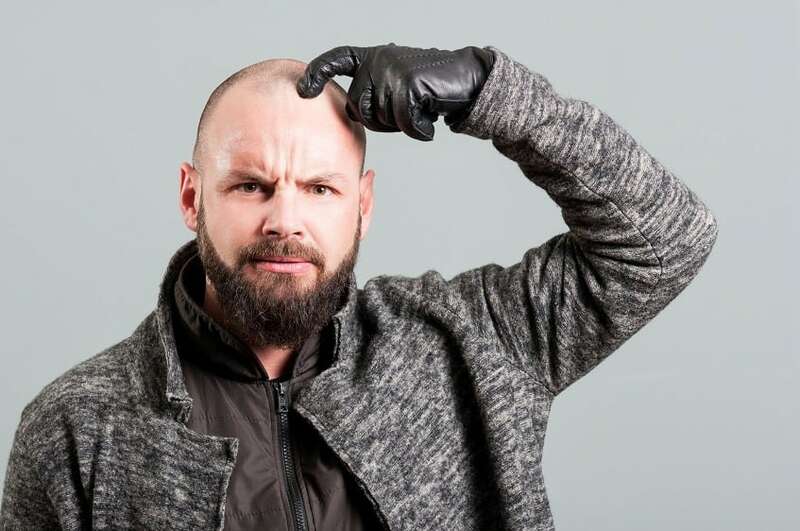 This is often uncomfortable or undesirable for users, which is why a lot of men prefer to stick to the butter for their beard care and grooming needs. Of course, it is all a matter of preference! The best way to find your favorite beard moisturizer for your ideal beard grooming kit is to experiment with different products until you find the type and brand that best suits your needs. Photos from: Geografika © 123RF.com and Catalin205 © 123RF.com. I Tried this recipe out after being unhappy with a number of beard products. Absolutely the most affordable method and easy to tailor to my personal needs. Do a little reading up on carrier oils and essential oils first so you make a educated purchase of products. I put probably about 40 US dollars into raw materials and ended up with probably a 6 month supply of Beard Balm, butter, oil and a wax for my curly stache. THANKS FOR SHARING THESE TIPS. Lanolin and castor oil mixed with eucalyptus oil, rosemary oil, peppermint oil and vitamin E oil. None of the beeswax. Soothing, nourishing and moisturising at the same time. Affordable as well. Thank you. Pour into tins and bam! Don’t waste that extra beard balm, butter or oil that is left on your hands after you’ve rubbed as much of it as you can into your beard. Rub the remainder onto your elbows and then individually into each of your cuticles. You’ll be amazed at how good both with look over time. No more dried, ashy elbows or unsightly dry cuticles. Also, rubbing (massaging) your cuticles will promote growth of your nails.